The two keys to creating fairer congressional districts in 2012. As this decade’s redistricting cycle begins, Republicans are licking their lips in anticipation. They already hold a sizeable 48-seat advantage in the House of Representatives. Thanks to their sweeping 2010 victories in state races, they will also have complete control over how 193 congressional districts are redrawn (compared to just 44 for the Democrats). In pivotal states like Georgia, Michigan, North Carolina, Ohio, Pennsylvania, and Texas, Republicans will be able to gerrymander to their heart’s content—to protect their own incumbents and target vulnerable Democrats for electoral eradication. Is there anything that Democrats (or fans of fair districts) can do to stop this onslaught? Wisconsin-style walkouts are one option, but even more promising are popular initiatives and referenda. Through the initiative process, available in about half the states, voters can place measures on the ballot that either impose strict criteria on how districts are drawn or transfer authority over redistricting from partisan legislatures to independent commissions. Through referenda, available in a similar number of states, voters can block legislatively enacted district plans from ever coming into effect. If the looming wave of gerrymandering is to be averted, both forms of direct democracy need to be used as aggressively—and as soon—as possible. Not surprisingly, scholars have found that the policies advanced by initiatives and referenda tend to result in better district plans. University of Mississippi professor Jonathan Winburn determined that, in the 2000 cycle, redistricters were mostly unable to skew lines to their advantage when they had to design districts that were compact, respectful of political subdivisions, and attentive to geographic communities (all requirements commonly written into initiatives). Another recent study by political scientists at the University of Georgia and Michigan State University concluded that commission-drawn maps result in more competitive elections than plans designed by self-interested politicians. Despite these advantages, most efforts to fight gerrymandering via direct democracy have failed. After examining redistricting initiatives from 1936 to 2005, I found that about two-thirds of them were defeated, usually because of the intense opposition of the state’s majority party. The measures were approved by the public only when some atypical factor—e.g., national scandal, Supreme Court intervention—reduced the effectiveness of the majority party’s resistance. The moment is therefore ripe for action by both Democrats and good-government advocates. (Republicans have little incentive to shake up the status quo, since they are currently in charge of so many key states.) Both groups should immediately start drafting redistricting initiatives and then gathering the necessary signatures to place the measures on 2012 ballots. The initiatives could be modeled on the recent Arizona, California, and Florida provisions, all of which were carefully crafted and prevailed at the polls. Specific states that Democrats could target, because they (1) are fully under Republican control, (2) have numerous congressional districts, and (3) allow popular initiatives, include Florida, Michigan, Ohio, Oklahoma, and Utah. Good-government types, who seek more sweeping reform, would want to add Arkansas (under full Democratic control) and Colorado, Missouri, Nevada, and Oregon (under split control) to the list. Granted, it may have been better for these initiatives to have been on the 2010 ballot, prior to the start of the current cycle. By 2012, many states already will have enacted their district plans for the next decade. But initiatives could circumvent this problem by undoing the legislature’s handiwork and establishing better district-drawing procedures. The measures just need to be drafted to accomplish both goals. And, while the timing in 2012 may not be as convenient, the odds of success should be substantially higher. The next 18 months will be full of stories about bizarrely shaped districts and partisan shenanigans. By the next election, the public should be primed to reject the dysfunctional status quo. In addition to preparing initiatives, activists should be ready to launch referenda that could nullify the gerrymandered maps that are sure to emerge from many state legislatures. For Democrats, Republican-controlled states to target include Michigan, Ohio, Oklahoma, and Utah. The good-government list would also comprise Arkansas, Colorado, Kentucky, Maryland, Massachusetts, Missouri, Nevada, and Oregon (all under Democratic or split control). Obviously, initiatives are preferable to referenda, in that they can make policy, not just reject it. But, even in states that only allow referenda, voters can send the potent message—repeatedly, if necessary—that they will not stand idly by as politicians manipulate district lines for partisan advantage. Democrats and good-government advocates, then, have nothing to lose (and much to gain) by pushing for redistricting initiatives and referenda everywhere that they are available in 2012. At worst, these efforts will fail and the status quo will persist. But, more likely, given recent trends, at least some of the measures will succeed. 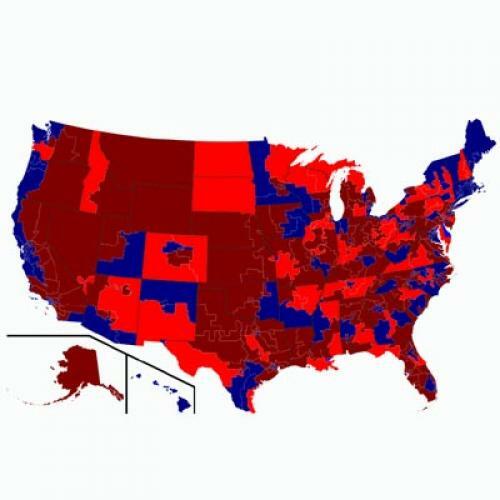 In this case, the Republican stranglehold on the House would be loosened somewhat, and a few (perhaps many) more of America’s districts would be redrawn fairly. Nicholas Stephanopoulos is an academic fellow at Columbia Law School, where he specializes in election law.